It's enough to pour over the Horseshoe Falls for 20 minutes. “This is a common problem for both sides – the pollution. We got it, too,” said Jim Silverthorn, a retired Hydro One employee whose regular walks take him near the Niagara Falls, Ont., outfalls. Why so much this year? The rainy months of April and May accounted for almost 60 percent of this year’s overflows. A dark, smelly release of effluent from a U.S. outfall at the base of the American falls thrust Niagara Falls into the international spotlight over the summer, with government officials, tourists and business people outraged about sewage spoiling Buffalo Niagara’s most recognizable natural wonder and Canada’s most popular tourist spot. “Because it happened at Niagara Falls, I think, it’s finally receiving a lot of the attention it deserves,” said Niagara Falls Mayor Paul Dyster. But data shows overflows occur on many days – and from both sides of the border. 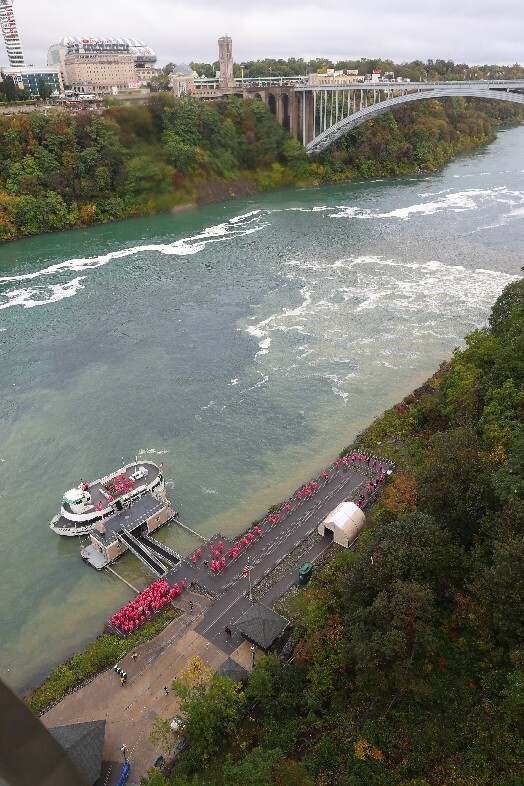 When millions of gallons of wastewater are released into the Niagara River over a 100-foot weir at the base of the American falls and in the Niagara Gorge on the U.S. side, you can watch it flow out of a pair of concrete outfall canyons. The Niagara Falls Water Board acknowledges it's "probably at the worst possible location" – at the water surface and in a spot where an eddy carries water toward the Maid of the Mist boat docks and the American Falls. The outfall was selected when its sewage plant was built in the 1970s because it already existed. On the Canadian side of the river, there are at least eight outfalls, but they are harder to see without scaling an 8-foot-high barbed wire fence. 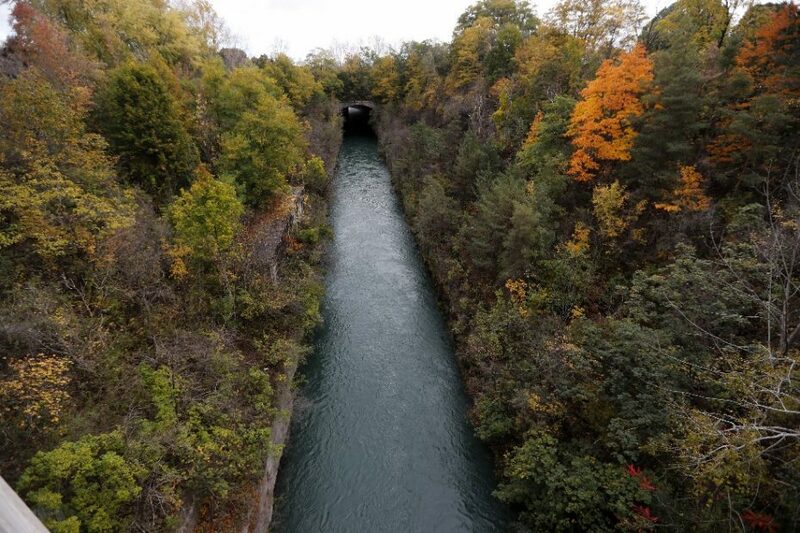 Most of them empty into a man-made hydroelectric canal that flows to the Sir Adam Beck hydroelectric plant at a rate of about 158,500 gallons per second. In most cases, those outfalls are at the base of a deep gorge. There are miles-long biking and hiking trails along the hydroelectric canal, but signs and barbed-wire fencing prohibit public access to the canal itself. The wastewater treatment plant on Stanley Avenue released more than 90 percent of the 191 million gallons in overflows reported on the Canadian side in 2017, but the discharges go into hydroelectric power canal and not directly to the Niagara River. On both sides of the border, stormwater overflows during heavy rains protect the sewage plants from damage when combined sanitary and storm systems overwhelm their systems. But only one side of the border – the American side – could have discharged the black, gunky substance that shocked tourists July 29. That’s because the sewer plant uses a carbon filtration system. Because of the presence of heavy industry on the U.S. side at the time, the plant was designed to treat and remove hazardous industrial chemicals with carbon filters when it was built in the 1970s. That predated federal environmental laws regulating discharging toxic industrial wastes to sewer systems. "At the time, the engineers believed that a biological treatment facility was not going to work in Niagara Falls, N.Y., because the industrial wastewater would be toxic or inhibitory to the biological treatment process," a Niagara Falls Water Board spokesman said. If built today, the plant would not be a physical chemical treatment plant, but probably like the one across the border in Niagara Falls, Ont. The Canadian plant, like many other wastewater treatment plants in use in the Buffalo Niagara region, uses biological methods – not carbon – to break down pollution in its sewage. It was residual carbon from a sediment tank that was backwashed during a cleaning operation and led to the black discharge in July, after an apparent misunderstanding among employees at its wastewater treatment plant. The wastewater plant in Niagara Falls on the U.S. side has the capacity to filter 60 million gallons of wastewater per day. Officials said the chemical process is not less efficient in managing wastewater volumes than the biological approach, but it's no longer the most appropriate technology. That's because its treatment process results in the creation of elemental sulfur, which can lead to a "turbid or opaque appearance" in wastewater effluent released to the river, especially between April and November, when the wastewater temperature is warmer, officials from the Water Board said. Unlike areas on the Canadian side, Niagara Falls, N.Y., has old bones. Much of its sewage infrastructure was installed 75 to 100 years ago, when the city was more populous. Outmoded technology dealing with stormwater, years of neglect and a changing climate are catching up with the city now. “It’s not like we abandoned the neighborhoods and closed up the sewers,” Dyster said. So, the city is renewing its attention to infrastructure. Innovative stormwater management techniques, including bioswales and increased green space, are being used at new hotels and construction projects, which include new Whirlpool Street and Old Falls Street. The replacement of the former Robert Moses Parkway with more green space and a natural habitat along the Niagara Gorge is also underway. This year, Niagara Falls has already broke its record for most days of 1 inch or more rain: 10 days. The 10 days accounted for nearly 70 percent of the city's reported sewage overflows: more than 410 million gallons. What's the alternative to bypassing treatment plants with sewage overflows? 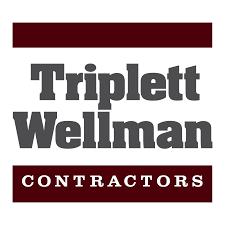 More sewer backups and flooded basements. "These localized overflows are typical in wastewater systems throughout the U.S. because overflows are generally preferred over the backup of untreated sewage into the basements or homes and businesses," a Niagara Falls Water Board spokesman said. Niagara Falls, N.Y., may be making gains toward improving infrastructure to reduce overflows, but the Ontario side seems to be taking bigger strides. The regional government provides upward of $6.6 million annually to municipalities like Niagara Falls, Ont., to curtail stormwater from infiltrating its wastewater stream. It also recently finished a plan to allocate more than $150 million dollars through 2041 to cut sewage overflow volumes. 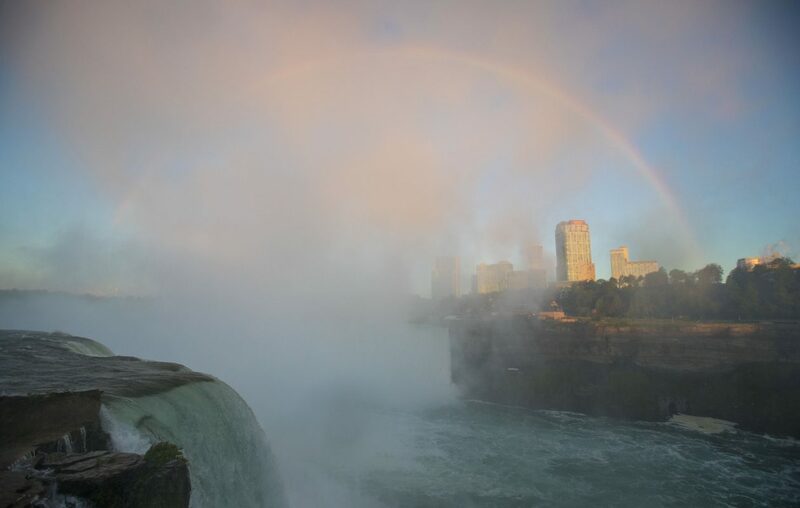 When 2.42 inches of rain fell was reported in Niagara Falls on April 30 and May 1 this year, the American side reported 139.8 million gallons of overflow. The Canadian side measured 22.6 million gallons. Then, on May 4 and 5, another 1.94 inches of rain fell. The American side reported 165.1 million gallons of overflows. Canada totaled 48.4 million gallons. Government grants for municipal infrastructure upgrades in New York State are available under a $2.5 billion clean infrastructure program put in place earlier this year by Gov. Andrew M. Cuomo and the State Legislature. Niagara Falls isn't getting any yet. "To date, the Niagara Falls Water Board has not applied for such state funding," the state Department of Environmental Conservation told The Buffalo News. Water Board officials said they're working with the DEC to identify the plant's needs and devise strategic improvements before seeking the state aid to pay for upgrades. The Niagara Falls Water Board pointed out it committed $1 million this year to improve its treatment facilities and identified $6.9 million for system upgrades next year, in addition to more than $8 million in other improvements it undertook over the last several years to cut infiltration to sewers by 4 million to 6 million gallons per day on dry weather days. 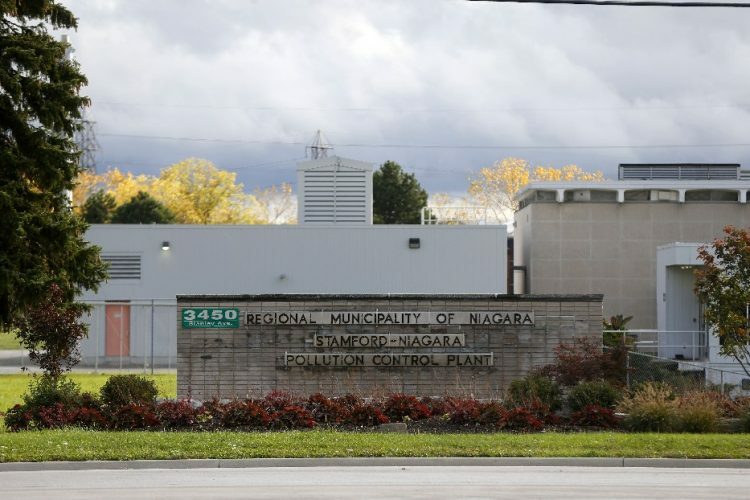 "Approximately $25 million in upgrades were made to outdated and inoperable treatment equipment at the wastewater treatment plant during the past 10 years,” a Niagara Falls Water Board spokesman said. "Unfortunately, the 40-year-old plant's capital improvement needs at this time far outweigh the resources available to the water board or its rate payers." Until it gets more money, "it is inevitable that the treatment plant effluent will continue to have a 'color' associated with it approximately eight months of the year," the Water Board said. 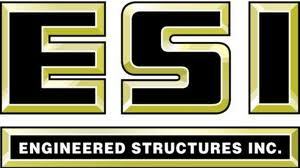 Regards, it is an honor to have completed the inspector course for Puerto Rico. I learned a lot with the lessons and, above all, very clear and precise.Thank you!